A poor, unattractive dentition can be transformed into a comfortable, functional dentition that can last for years to come. Though however attractive they may be, permanent dentures do come with a price. A dental bridge fills in the gap between teeth by replacing the missing tooth with a prosthetic one made out of metal or porcelain which is then anchored to the adjacent healthy teeth. There are several types of fixed dental bridges including conventional dental bridges, cantilever bridge and resin-bonded bridge. 1) Examination of the condition of the mouth to check whether you are suitable for a dental bridge, restoration of the anchoring teeth if any and preparation of involved teeth under local anesthesia. 2) An impression of the involved area is taken with a putty-like material to be used as a model to fabricate the bridge. 3) A temporary bridge is given to protect the gums and teeth from damage while the bridge is being constructed. 4) The bridge will be fitted and cemented on the second visit. It would cost around $200 to $2,000 per bridge depending on the factor stated above. 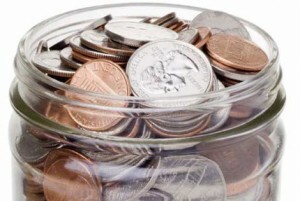 Most major dental insurance plans cover 50% of the total cost of dental bridges. The ideal standard of care for replacing teeth is not a denture or even a bridge anymore, but dental implants. Dental implants can be used to replace single or multiple missing teeth, stabilize loose dentures, straighten teeth and rehabilitate patients who have lost parts of their jaw and face due to cancer or accidents. 1) Before the implant is placed, an examination of the condition of your mouth and x-rays are taken for evaluation to see whether you are suitable for one. 2) Titanium cylinders are painlessly drilled into the jaw bone and temporary teeth are given to allow normal functioning of the mouth. 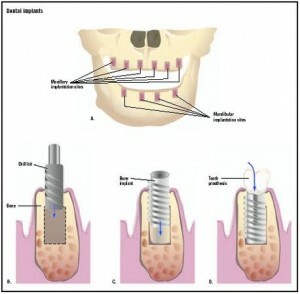 3) After 3-6 months, the jaw bone will heal and the integrated implants are screwed into place. 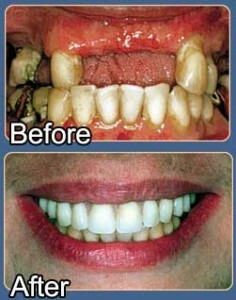 A fixed bridge or a denture will be attached on top. Mini implants (having half the width of a traditional implant, do not contain a screw and could be done in one visit) would cost about 30% less. A single dental implant can range from $2,000 to $5,000 while full mouth reconstructive dental implants can range from $24,000 to $100,000. Though dental bridges are covered by most dental insurance plans, a dental insurance policy does not automatically include dental insurance for implants. Make sure you check with your insurance provider and read any dental insurance policy that you have thoroughly before signing up for an implant surgery or it can cause significant problems for your budget. Generally a dental bridge in Malaysia can range between RM500 ($143) to RM2,000 ($573) based on the cost factors stated above while a single dental implant can vary between RM5,000 ($1434) to RM9,000 ($2582) in the private practice. Government dental specialist clinics provide implants as well and at lower rates compared with private fees, but case selection often favors functional purposes. The cost for dental implants in Malaysia is one of the lowest in South East Asia whereby you can enjoy the benefits of dental implants at international standards and yet at half the price or less. Dental implantology has placed Malaysia on the map as a major destination for health tourism in this region. 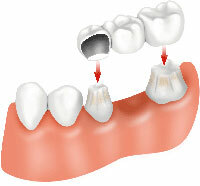 In conclusion, permanent dentures are an alternative choice for replacing and restoring teeth. Though expensive, dental implants are more cost effective than other methods and are a great substitute for dentures and bridge work. Before making your decision, it is wise to consult with your dentist beforehand and financially plan the choice you made. Modern technology as I say over and overs is a benefit to all.It makes impossible procedures be done safely and successfully.It is not surprising at all that medical and dental practioners are one of those who make use of technology wisely.